Talk about thinking outside not just the box but the entire House of Mouse. Similar to the way that Tom Hanks warned Bitty Schram in A League of Their Own that “there's no crying in baseball,” as far as I'm concerned there's no animation involving Nazis either. Yet, while you don't typically think of “lighthearted family entertainment” and “World War II” going together like “peas and carrots” to quote Hanks in Forrest Gump, luckily Walt Disney decided to put a whole different spin on their tried and true technique of combining live action with animation via 1971's uneven and overlong yet still beautifully crafted Bedknobs and Broomsticks. In fact, the two films would be ideal for a Disney double feature due to the amount of cinematic overlap between the two in terms of cast and crew such as actor David Tomlinson, director Robert Stevenson, as well as musical and animated numbers that either seem repetitious or were designed for Poppins and then presented in Bedknobs as though it were an unofficial sequel and/or interchangeable. And although it marks the last time that a Disney feature earned an Oscar (this time for special effects) for eighteen years until The Little Mermaid drew viewers “Under the Sea” in 1989 and the combination of live action and animation surpasses other attempts by the studio including the painfully dull Pete's Dragon, it doesn't hold up nearly as well as the “positively perfect” Mary Poppins. Yet for a long while it works well “in the most delightful way” as an old fashioned magically tinged period piece wherein an endearing Angela Lansbury takes three displaced London siblings under her wand and spell when they arrive in the country setting of Pepperidge Eye where the children were sent to avoid the horrific Nazi bombings of the city. And although Lansbury's Miss Price shares Mary Poppins' magic touch, she's less devoted to becoming a nanny or host and far more dedicated to finishing her correspondence course as an apprentice witch. While she tries to hide her vocation from young Carrie, Charlie and Paul, the kids catch on soon enough. And faster than you can sing a song, they journey with her to find a missing spell on her flying bed (which definitely beats walking and is far greener than automobiles) as they make the acquaintance of new friends, sing more songs, and travel to an animated land before Price sets her sights on ridding England of Nazi invaders. While there's nothing objectionable in the film and the musical numbers are extremely well staged including a standout with “Portobello Road,” and it's fun to see Lansbury in a whimsical and feisty pre-Jessica Fletcher Murder She Wrote characterization which is strengthened when she shares scenes with Tomlinson, overall Bedknobs feels extremely disjointed as the action moves uneasily from the harsh reality of wartime to the animated Naboombu. Since I am unfamiliar with the source material of author Norton's original two books, I can't speculate if the fault of the films was in trying to combine a few too many plots or characters that were spread out between the two works but I think the movie would've managed to overcome the daunting post-Poppins release by dividing up the action into two separate films or leaving out the Nazi angle altogether since it may confuse small children not to have any reference point for what's happening. Essentially it was intended as a dazzling work of entertainment to inspire awe in youngsters and engage grade school age children with a more substantive plot. Yet by trying to combine the two, the movie falters irrevocably since pouring everything onto that flying bed obviously isn't the right way for parents to start a dialogue on World War II and the horrific devastation that still echoes throughout society today. And despite the fact that I admire the craftsmanship and high caliber ingredients stirred into the Bedknobs cauldron and realize that without it that Oscar would've been nonexistent but in my view, the right way to address the material and do it justice would've been by avoiding the combination of animation and live action altogether. And perhaps as Roger Ebert suggested, the filmmakers could've used Naboombu for the setting of one film on its own to satisfy the youngest Mouseketeers. In the same token, by focusing on the characters of the World War II plot as the kids cope with life in the country with an aspiring witch and a phony professor to humorous yet more realistic effect, viewers who today relish the adventures of a young boy who attends a school for witchcraft and wizardry via the Harry Potter franchise would've also found it far more entertaining. Unfortunately it's blessed and cursed with being a product of the Poppins team. And since it doesn't work on that level, it would have been a worthwhile risk to try and bring in either fresh eyes or a decidedly different technique on board so the movies don't seem to simply ooze into one another despite being seven years apart. While it's still a nice vintage film and boasts a tremendous amount of quality for a family intended work even by today's standards since Disney never fails to go all out to entertain, it doesn't hold up visually quite as well as Poppins but much like its superior predecessor, it manages to surpass other films of 1971 with a contemporary DVD release since as a period piece, the age of the print doesn't grab our attention as it does in other works made by the House of Mouse set that very same year. Trying to shoot for today's Disney demographic, the DVD ties in the magical theme the studio's loved for years by linking to Disney Channel's TV series The Wizards of Waverly Place in an extra featurette on movie magic. Additionally it also contains some rare footage including a deleted song and Tomlinson recording vocals for “Portobello Road” in the music studio. 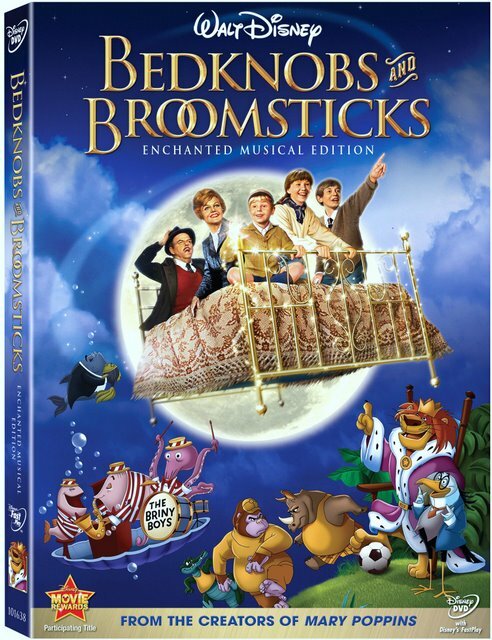 Likewise, staying true to the title of an Enchanted Musical Edition, the DVD celebrates those behind the songs and their place in Bedknobs to make sure that it remained a lighthearted family film with animation and Nazis by keeping things spirited and imaginative without any crying in baseball nor too many peas and carrots.